The Skagit Valley Food Co-op is turning 35 this year, and inspired by our neighbors in Oly, we’re having a “Procession of the Produce” Parade, with artichokes and asparagus, mushrooms and butternut squash, watermelon and grapes, bees and honeycomb and blueberries. I’ve been hosting paper mache parties on fridays in the studio shop. Tonight Britt and Matthew and Shelley came over with Eva and Simone, two gorgeous little girls, to prepare Eva’s blueberry costume for the parade. Eva took off her dress and painted herself pink. Also some flower petals – while I tackled corn husks and bee wings. The term fruit has many different meanings depending on context. In botany, a fruit is the ripened ovary—together with seeds— of a flowering plant. In many species, the fruit incorporates the ripened ovary and the surrounding tissues. Fruits are the means by which flowering plants disseminate seeds. In cuisine, when food items are called “fruit”, the term is most often used for those plant fruits that are edible and sweet and fleshy, examples of which include plums, apples and oranges. But in cooking, the word fruit may also rarely be loosely applied to other parts of a plant, such as the stems of rhubarb, which are made into sweet pies, but which are not botanically a fruit at all. Although the word fruit has limited use in cooking, in reality a great many common vegetables, as well as nuts and grains, are botanically speaking, the fruits of various plant species. No single terminology really fits the enormous variety that is found among plant fruits. The cuisine terminology for fruits is quite inexact and is likely to remain so. The term false fruit (pseudocarp, accessory fruit) is sometimes applied to a fruit like the fig (a multiple-accessory fruit; see below) or to a plant structure that resembles a fruit but is not derived from a flower or flowers. Some gymnosperms, such as yew, have fleshy arils that resemble fruits and some junipers have berry-like, fleshy cones. The term “fruit” has also been inaccurately applied to the seed-containing female cones of many conifers. With most cultivated fruits, pollination is a vital part of fruit culture, and the lack of knowledge of pollinators and pollenizers can contribute to poor crops or poor quality crops. In a few species, the fruit may develop in the absence of pollination/fertilization, a process known as parthenocarpy. Such fruits are seedless. A plant that does not produce fruit is known as acarpous, meaning “without fruit”. The term “vegetable” generally means the edible parts of plants. The definition of the word is traditional rather than scientific, however. Therefore the usage is somewhat arbitrary and subjective, as it is determined by individual cultural customs of food selection and food preparation. Generally speaking, a herbaceous plant or plant part which is regularly eaten as unsweetened or salted food by humans is considered to be a vegetable. Mushrooms, though belonging to the biological kingdom Fungi, are also generally considered to be vegetables, at least in the retail industry. Nuts, seeds, grains, herbs, spices and culinary fruits are usually not considered to be vegetables, even though all of them are edible parts of plants. In general, vegetables are regarded by cooks as being suitable for savory or salted dishes, rather than sweet dishes, although there are many exceptions, such as pumpkin pie. Some vegetables, such as carrots, bell peppers (or Capsicum as they are known in Australia) and celery, are eaten either raw or cooked; while others, such as potato, are traditionally eaten only when cooked. A legume is a plant in the family Fabaceae (or Leguminosae), or a fruit of these plants. A legume fruit is a simple dry fruit that develops from a simple carpel and usually dehisces (opens along a seam) on two sides. A common name for this type of fruit is a “pod”, although pod is also applied to a few other fruit types, such as vanilla. Well-known legumes include alfalfa, clover, peas, beans, lentils, lupins, and peanuts. A peanut is not a nut in the botanical sense; a peanut is an indehiscent legume, that is, one whose pod does not split open on its own. 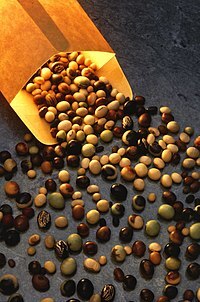 The history of legumes is tied in closely with that of human civilization, appearing early in Asia, the Americas (the common bean, several varieties), and Europe (broad beans) by 6,000 BC, where they became a staple, essential for supplementing protein where there was not enough meat. Legume plants are noteworthy for their ability to fix atmospheric nitrogen, an accomplishment attributable to a symbiotic relationship with certain bacteria known as rhizobia found in root nodules of these plants. The ability to form this symbiosis reduces fertilizer costs for farmers and gardeners who grow legumes, and means that legumes can be used in a crop rotation to replenish soil that has been depleted of nitrogen. Legume seed and foliage have a comparatively higher protein content than non-legume material, probably due to the additional nitrogen that legumes receive through nitrogen-fixation symbiosis. This high protein content makes them desirable crops in agriculture. Farmed legumes can belong to numerous classes including forage, grain, blooms, pharmaceutical/industrial, fallow/green manure, and timber species, with most commercially farmed species filling two or more roles simultaneously. Forage legumes are of two broad types. Some, like alfalfa, clover, vetch, stylo, or Arachis, are sown in pasture and grazed by livestock. Other forage legumes such as Leucaena or Albizia are woody shrub or tree species that are either broken down by livestock or regularly cut by humans to provide stock feed. Bloom legume species include species such as lupin, which are farmed commercially for their blooms as well as being popular in gardens worldwide. Industrial farmed legumes include Indigofera and Acacia species, which are cultivated for dye and food gum production respectively. Fallow/green manure legume species are cultivated to be tilled back into the soil in order exploit the high nitrogen levels found in most legumes. Numerous legumes are farmed for this purpose including Leucaena, Cyamopsis, and Sesbania species. Various legume species are farmed for timber production worldwide including numerous Acacia species, Erythroxylum species and Castanospermum australe. The term is derived from the Latin word legumen (with the same meaning as the English term), which is in turn believed to come from the verb legere “to gather.” English borrowed the term from the French “légume,” which, however, has a wider meaning in the modern language and refers to any kind of vegetable; the English word legume being translated in French by the word légumineuse. Legumes are good sources of iron and fiber. All hail the plant kingdom.